Wir werden grillen! means: "We will have a BBQ." Mmm... meat. 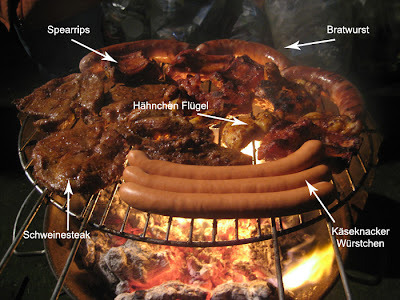 I was treated to a proper down home barbecue last weekend by my host family here in Germany. And when I say 'proper', I do mean 'proper'. As a proud Australian, I do attend my fair share of barbecues, but these are generally simple affairs, involving a gas BBQ, a few snags and burgers, Wonder White bread and tomato sauce. And beer. Lots of beer. As you can see from the above photo, Friday night's BBQ was an rather different affair. Some elements were the same though. The women made the salads, and the men did the grilling. (I can't tell if that's sexism, tradition, neither or both!) My host mother made her famous German Potato Salad. I haven't got the exact recipe written down (yet! ), but let me tell you, the secret ingredient is bacon fat! 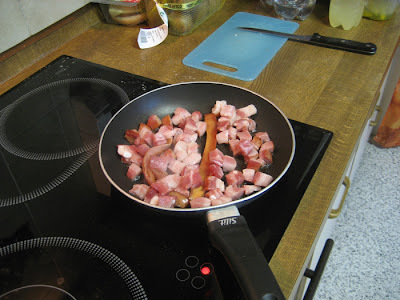 Pieces of speck rendering in a pan. 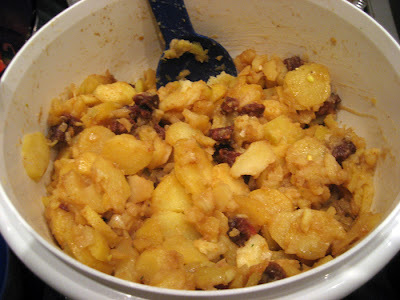 With potatoes, onions and other seasonings. It was so damn good. It was like, the flavour of Smith's Cheese and Onion chips (but not artificial at all, obviously), combined with the contrast of softly bland potato against crispy, salty speck. Mmm'hmm. The leftovers were delicious, eaten ravenously by me the next day, straight out of their tupperware from the fridge. Ok, let me draw your attention away from the wunderbar kartoffelsalat for a moment, and show you the fire! 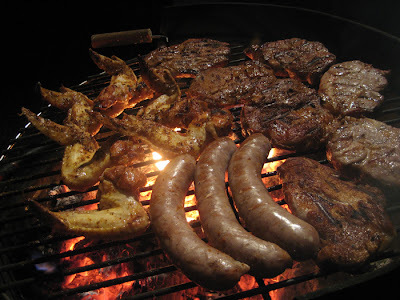 Wood fired barbecues are quite a bit trickier than gas ones, but they do give your meat a fantastic smoky flavour. My host father always uses the trunk of a grapevine, as he says it's the best for barbecuing. I'm not sure if that's readily available in Australia, but I suppose it's worth a go! 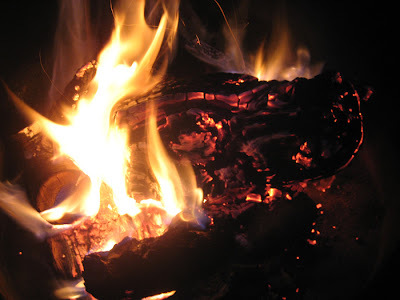 You have to get the wood alight a fair while before you want to cook, so that it has time to turn from 'logs of wood being licked by flames', into glowing embers. Basically, once the fire looks like the depths of hell, you're right to start. Here is the meat again! The extended family came round, thus requiring 2 separate barbecues, operating side by side: one for our family, one for Uncle Wilhelm's. 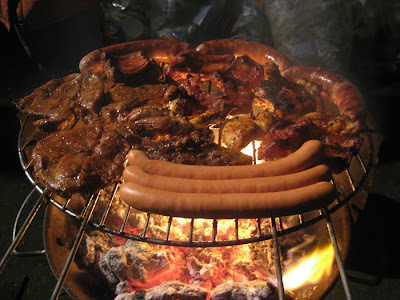 My host father's BBQ had spare ribs, bratwurst, chicken wings, cheese sausages and pork steaks. All the non-sausage items had different marinades on them. I was in carnivore's paradise. This here is Uncle Wilhelm's BBQ. It had pretty much the same things, with slightly different marinades. Too cold to eat outside, we retreated to the warmth of the partyraum and chowed down. 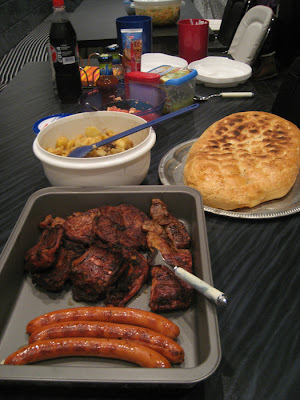 In addition to the meat on the tray, we have a whole Türkische Brot, briefly grilled on the barbecue after most of the meat was done. Condiments include tomato sauce, mayonnaise, white cabbage salad, steak sauce and mustard. 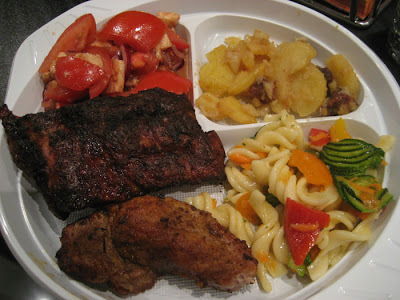 On this plate we have (clockwise from top left), a tomato mozzarella salad, the kartoffelsalat, an "Australian Noodle Salad", some pork steak and some spare ribs. The recipe for the Australian salad, I was interested to learn, was picked up by a family friend whilst on holiday in Australia. It contained pasta, capsicums, cucumbers, gherkins and dressing. As I previously mentioned, I haven't done a proper fire barbecue before, and I am keen to give it a go once I get home; anyone (especially Aussies!) got any tips or pointers? Awesome feast!!! Everything looks delicious! I have a near-obsession on grilling marinated lamb chops, which I think deserve a slate on your Aussie BBQ. Marinate in olive oil and fresh lemon juice, a little salt and pepper, and throw on a super-hot fire so that the flames char the chops. omg what a meat-feast! love it! the 'australian noodle salad' is so cute too! Wow! Sarah, I love bbq's..... shame it's so cold outside!